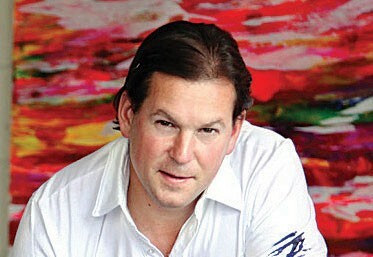 Will Day ’93 has always been drawn to the idea, as he puts it, of bringing different minds together. At Ohio Wesleyan, he pursued majors in international studies and French because he thought he wanted to be a diplomat. Instead, he ended up in finance and working as an architectural consultant before a layoff in 2007 presented him with the opportunity to reinvent himself as an artist. “We all have to find a way to enter into what we love,” Day says. The Day family: Spencer, Abigail, Aimee, and Will. It worked. 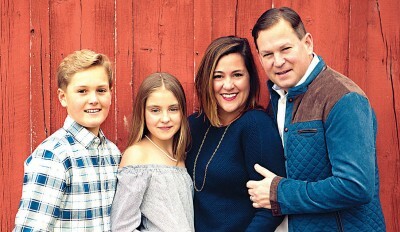 Day was slowly able to build a business and full-time career to support his family, including his wife, Aimee, son, Spencer, 14, and daughter, Abigail, 12. After meeting JP O’Brien, the CEO and managing partner of Black Lab Sports through their sons’ lacrosse league in 2016 Day took up residence in a studio inside the sports tech incubator and business accelerator’s offices, the embodiment of his desire to combine viewpoints. 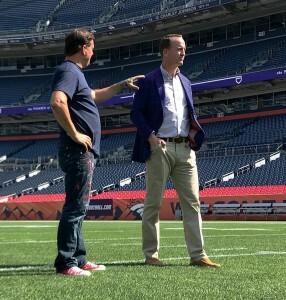 In early 2018, his home base led to another connection, this time with Mac Freeman, the chief commercial officer of the Denver Broncos NFL team, and another opportunity to combine two disparate worlds: Day was commissioned to capture legendary quarterback Peyton Manning on canvas. The No. 18 jersey, command control at the line of scrimmage, and shouts of “Omaha” are familiar hallmarks of the future Hall of Famer, who is best known for his time with the Indianapolis Colts but went out on top after winning Super Bowl 50 in 2016 with the Broncos. Will Day and Peyton Manning inside Mile High Stadium in Denver, site of Manning’s last four seasons of his 18 in the NFL. Day worked on the piece for three months, settling on a final size of 8 feet tall and 7 feet wide. “I wanted to capture something bigger than him, I wanted the vertical to be about Peyton’s silhouette,” Day says. 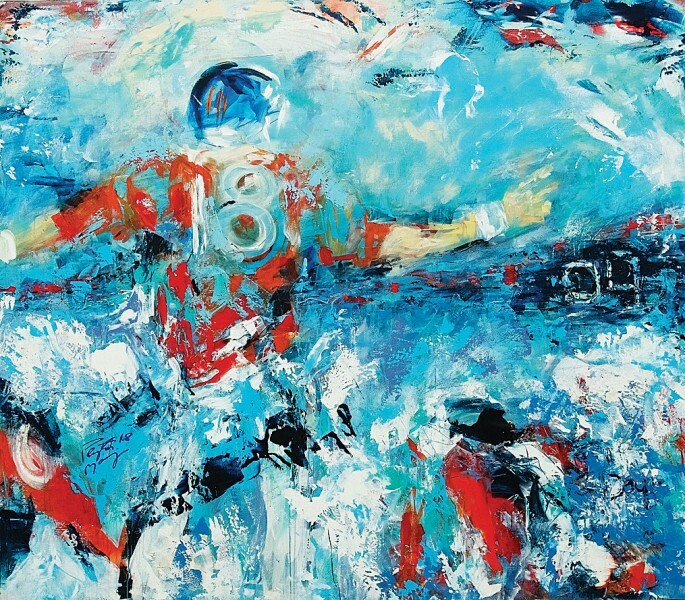 Day’s commissioned 8-by-7-foot work Omaha captures the frenetic energy and intensity of Manning at the line of scrimmage. It takes its name from Manning’s trademark audible call and now resides on the club level of Mile High Stadium. The piece was unveiled in August, and was featured in a documentary that aired on the Denver NBC affiliate. It now hangs on the club level of Mile High Stadium, where the team plays. As a Broncos fan, Day calls the experience a career highlight. “Ohio Wesleyan taught me to say, ‘What is your dream? Go get it – we’ll figure it out,’” he says.